Sometimes losing something that means everything can lead to a calling that means so much more. Such is the case for Wendy Huntbatch who in 1993 founded the World Parrot Refuge in Coombs, British Columbia, after four of her parrots were stolen. She now cares for hundreds of these gorgeous tropical birds, all of which are on the Endangered Species List. Heartbroken, Huntbatch, an animal welfare advocate, put the word out, hoping someone would be able to help recover their birds. Instead, people started offering her their own parrots, for which they could no longer care. “Within two weeks we had 15 large birds,” she says. 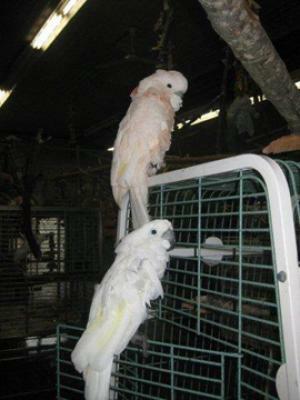 They have since recovered one of their stolen parrots, which eventually turned up at the sanctuary, but the other three have yet to resurface (one of the original six, the mate to one of the stolen birds, never recovered from its loss and passed on as well). Word continued to spread and birds continued to arrive. “In no time at all our house seemed to get full so we bought a 2000 square foot sanctuary for them, with flights on the outside. I moved 75 birds out of my house and we proceeded to collect another 75,” she laughs. 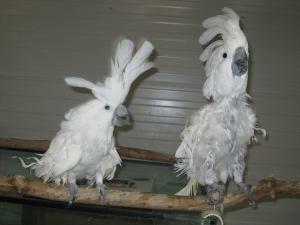 In 2004, the Huntbatches sold that facility and moved their then 400 birds to the refuge’s current location on Vancouver Island. 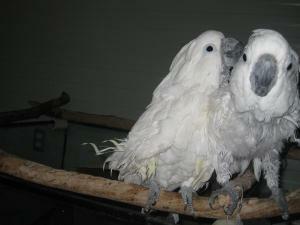 Now North America’s largest sanctuary for unwanted, abandoned and abused parrots, the World Parrot Refuge is currently home to 800 former pet parrots that represent more than 70 different parrot species. Huntbatch estimates they receive an average of 100 to 120 new birds each year. There are roughly 372 species of psittaciformes (parrots) in the world, and three families: psittacida (true parrots, predominantly green), cacatuidae (cockatoos — mostly white or black) and strigopidae (endangered New Zealand parrots — greys, browns). Sixty-five species are on the Endangered Species List (www.earthsendangered.com). “All parrots are on the Endangeed Species List, including Budgies and cockatiels,” says Huntbatch. “However, this list is divided into 3 categories — appendix one, two and three. Appendix one covers the critically endangered species. We have a large number of them — Hyacinth Macaws, Scarlet Macaws, Military Macaws, Moluccan Cockatoos, Lesser Sulfur Crested Cockatoos, Citron Crested Cockatoos, Triton Cockatoos, Goffins Cockatoos, Green Cheeked Amazon Parrots, Double Yellowheaded Amazon Parrots, Yellow Naped Amazon Parrots and Red Lored Amazon Parrots. These are all I can think of right now. Huntbatch’s feathered friends find their way to the World Parrot Refuge from across North America for any number of reasons, but often come from owners that have developed health problems, can no longer afford to keep them or have predeceased their pets. “One of the biggest reasons that we see is ‘I have asthma; my child has asthma or my uncle, my mom.’ There’s always somebody in the home with asthma, which is really brought to the forefront by the allergic reaction to the bird dander. 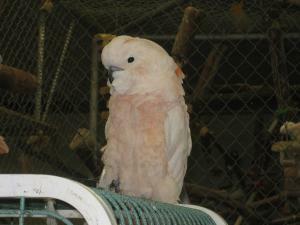 We’ve had 10 birds come in in the last two weeks totally because of asthma,” she says. 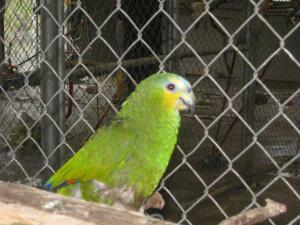 More often than not, the birds arrive at the World Parrot Refuge in poor health, Huntbatch says. “I would say 40 per cent of the birds come to us in good shape; 60 percent come in really bad shape.” Huntbatch, her staff of 17 and a core group of volunteers nurse the birds back to health before integrating them into their ever-growing flock. Once socialized, the birds are free to fly throughout the 23,000 square foot facility. Caring for that many birds is an expensive proposition. In 2008, it cost $330,000 to operate the World Parrot Refuge and although they do have both individual and corporate support Huntbatch acknowledges that their single greatest challenge is raising enough money to keep the sanctuary operating. Funding cuts by the B.C. government left a $100,000 hole in their operating budget in 2009 and they are still working to fill that void. The facility also collects gate receipts from visitors and operates a gift shop on site. Named by Travelocity as one of the Top 25 hidden tourism gems in Canada, the World Parrot Refuge is open to the public from 10 a.m. to 4 p.m. every day of the year and attracts thousands of visitors annually. For the price of admission (ranging from $8 to $12 per person) visitors are taken through the facility where they can see the birds flying free and also have the chance to interact with them; if you visit, be prepared to have at least one bird land on you at some point. The only part that isn’t open to the public is the special needs area, where disabled or injured birds are kept. Huntbatch’s free flying brood need not ever worry about feeling trapped again. She is currently building another flight for the budgies and cockatiels that are often just dropped off at their door and is hoping to build a veterinary hospital on site, which will serve as a training facility for future avian veterinary specialists and provide another steady income stream and volunteers for the facility. When asked what she finds most rewarding about operating the World Parrot Refuge, Huntbatch says it’s “knowing that they are not going to go from home to home to home on the pet adoption go-round. And they’ll never be locked in cages again. And they’ll never have somebody throw something at them or scream at them. And they’ll never have to be covered with a blanket and told to shut up. We hear that from the birds so many times; if one bird screams, another one will say, ‘Shut up! Shut up now!’ so you know what life a bird has lived. For more information, visit www.worldparrotrefuge.org.